In 2013, there were 5 million swimming pools in the United States according to the APSP, Association of Pool & SPA Professionals. Of those, 1.2 million are in California, meaning we have almost one fourth of the swimming pools in the entire country! With the drought such a problem in California and energy prices increasing daily, you might wonder about having a pool installed, and even whether you should have your pool re-surfaced. Read on! “Environmentally, it is a huge deal how much water these people are using,” geographer Joseph K. Lee said. The California Urban Water Conservation Council in a 1999 study concluded that for 194 homes with swimming pools, the addition of a swimming pool increased demand for water between 22 to 25 percent. However, adding an automatic sprinkler system for a lawn increased demand between 54.9 to 60.6 percent. The same study concluded pools use about as much water per square foot as irrigated lawns. “Getting rid of grass to make way for a pool maintained with best practices can save water in the long run,” said Penny Falcon of the Los Angeles Department of Water and Power. Here are some other water-saving tips: don’t fill it up so high in order to prevent water loss from splashing; use pleated filters that reduce backwashing; if heated, lowering the pool temperature reduces evaporation; plant shrubs as wind barriers to prevent water wave overflow. 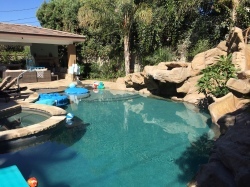 SNYDER LANDSCAPE AND ASSOCIATES absolutely works with homeowners who want to enjoy their outdoors with a swimming pool, while still being sensitive to the water shortage. People know that having a swimming pool adds value to their homes in warm climates like Southern California. Many people believe pools increase the aesthetic value of their yard. Pools provide an easy way to instantly cool down on hot days. Some people use swimming pools exclusively for in-water exercises and say pools add health benefits for them. Installing a solar heating system can reduce swimming pool heating costs. Using a Pool Cover is the single most effective means of reducing pool heating costs and reducing evaporation. Managing the water temperature by choosing an efficient pool temperature and turning the temperature down or off saves energy. Installing an energy-efficient, variable speed pump saves energy and money. We have called all the water districts in our current marketing area, and they are not outlawing new or remodeled swimming pools. However, we know that every little bit of savings helps! It all adds up. SNYDER LANDSCAPE AND ASSOCIATES can ”drought-i-fy” (we made that up!) your landscape design to reduce both your overall water usage and the cost of irrigation. SAVING WATER: Pool water that is emptied into the sewer system will be recycled through the cities’ recycling programs and can be used again. WASTING WATER: Water that is allowed to drain into the street or storm drain system is not recycled, and therefore wastes water. SNYDER LANDSCAPE AND ASSOCIATES invites you to enjoy a swimming pool and/or spa and reduce your water usage at the same time. We’re a licensed, insured, award-winning company that has helped our clients enjoy their outdoors for over 25 years. Let us know how we can help you achieve your dreams.